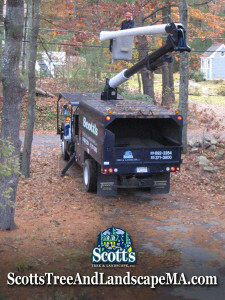 Tree pruning and storm damage cleaning up the in Westford, MA. Hurricane Sandy hit in October, but left damage far into November. 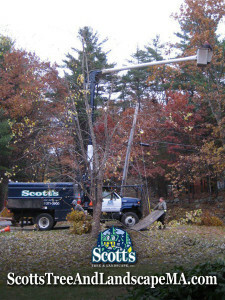 Here you see the bucket truck safely removing hanging branches. This entry was posted	on Thursday, November 17th, 2011 at 3:02 am	and is filed under Tree Removal. You can follow any responses to this entry through the RSS 2.0 feed. You can leave a response, or trackback from your own site.